Dubai’s ever-changing landscape makes it a challenging place to map with a constant stream of new and changing road systems and street names. 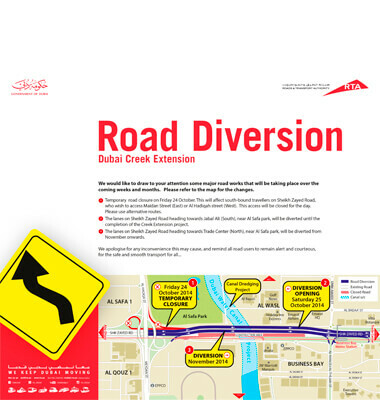 Explorer was commissioned by the Roads & Transport Authority Headquarters in Dubai to create a Dubai Creek Extension Map to chart and record the road works and diversion plans that took place during the works. The Sheikh Zayed Road Diversion Map was produced using Explorer’s experienced and talented cartographers in tandem with the RTA. The resulting map detailed clear road diversions, travel disruptions and focused formidably on this ever-evolving city.